If you think English-to-Metric is easy-peasy, challenge yourself with is alternate Measure Equivalents Conversion Sign. This would make interesting visual merchandising propping in Grocery, Baked Goods, Speces and Seasonings, and more. 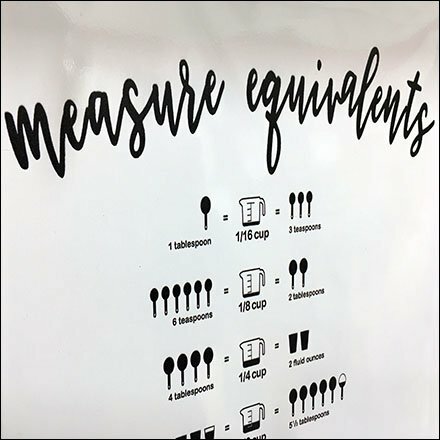 Look closely to see that there is even a conversion from Cups to Tablespoons, in case your smashed yours and need to dole out ingredients the hard way. For other interesting propping see a craft store near you. This Measure Equivalents Conversion seen at Michaels.